The last week of August brought us a mixed bag, hot at the beginning, rain in the middle and cooler towards the end. Our fishing has been on the same track, some days are great while others were a little slower. Overall we did manage to have another good week including a few nice fresh silver bullets! Our rivers all received a much needed bump in water but we certainly could use more. The Bonaventure is fishing well but we had to work a little harder. The Petite 's water is low but the temperature is fine, we continue to do well on the Petite. The Grand Cascapedia needs some rain, we're having action every day but having to work harder, the branches are still too low for good fishing. 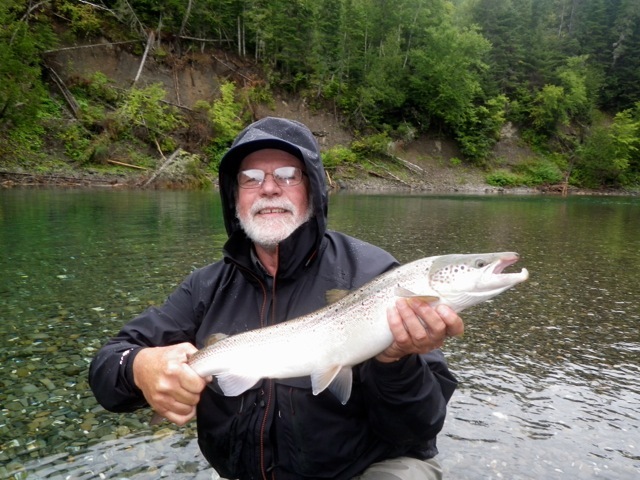 Claude Lombardo came all the way from New Caladonia, this is his first Atlantic Salmon, Congradulations Claude! Reports from all over the Atlantic salmon world are telling the same story, 2014 has been a tough year and returns are down everywhere. There's no doubt our rivers have less fish than normal but we are very fortunate to be doing much better than the majority. Number of two sea winter fish, those in the 12 to 15 pound class are down considerably but we do have a good number of big salmon and plenty of grilse. Normally we have 20% grilse and 80% salmon ratio, this year it's about 50/50. If there's a silver lining, a good grilse year has always been followed by a good salmon year. Randy Spencer with his first Bonaventure salmon, way to go Randy! 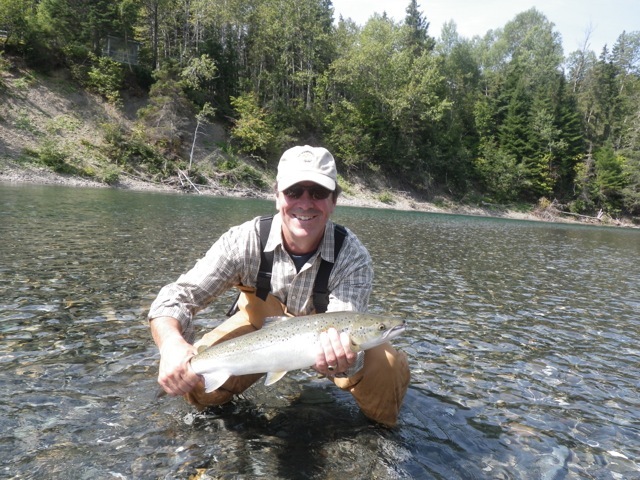 Rob Wadsworth releases a fresh grilse back to the Bonaventure, way to go Rob! The weatherman is calling for Rain on Monday and showers on Thursday, keeping our fingers crossed.